Have you tried the Indian paan? If you are in India and not tried the “dessert” after a meal then you sure are missing something. Everyone knows a “paan” in India, and meals are often rounded off with it. It is a fragrant mixture of betel nut (also called areca nut), lime paste, spices and condiments wrapped in an edible, silky paan leaf. Peddled by paan-wallahs, who are usually strategically positioned outside busy restaurants, paan is eaten as a digestive and mouth-freshener. The betel nut is mildly narcotic and some people eat paan the same way heavy smokers consume cigarettes; and over years of consuming it these people’s teeth can become rotted red and black. There are two basic types of paan: meetha (sweet) and saada (with tobacco). A parcel of meetha paan is a splendid way to finish a satisfying meal. Pop the whole parcel in your mouth and chew slowly, allowing the juices to oooooooze. Betel leaf with coconut, fruit preserves, gulkand (rose petal preserves, various spices. May also include maraschino cherry. Alternatively, South Asian sweet paan may contain candied fruits and/or candy-coated fennel seeds. Bengali paan is known as deshi mahoba, and has a delicate flavour. 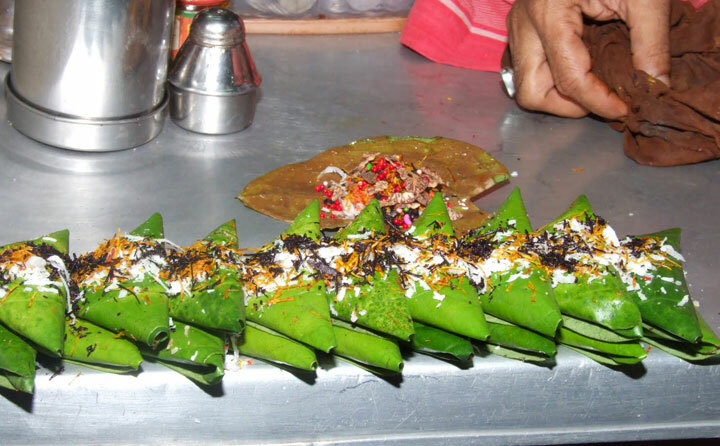 Maghai paan and jagannath paan are the signature varieties of Varanasi. The flavor and potency of paan depends, too, on the betel cultivar used, and the age of the plant at harvest. In South India, paan prepared from small and fragile leaves is called chigrlayele. In India, black paan leaves—ambadi and kariyele, which are thicker than the green leaves—are often chewed with tobacco.